Morbidity and mortality of breast cancer patients are drastically increased when primary tumor cells are able to spread to distant sites and proliferate to become secondary lesions. Effective treatment of metastatic disease has been limited; therefore, an increased molecular understanding to identify biomarkers and therapeutic targets is needed. Breast cancer metastasis suppressor 1 (BRMS1) suppresses development of pulmonary metastases when expressed in a variety of cancer types, including metastatic mammary carcinoma. Little is known of Brms1 function throughout the initiation and progression of mammary carcinoma. 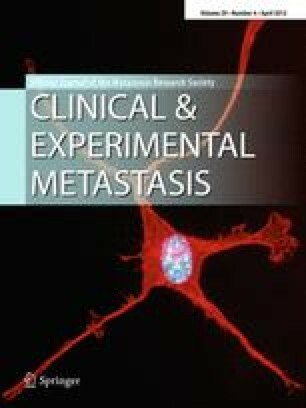 The goal of this study was to investigate mechanisms of Brms1-mediated metastasis suppression in transgenic mice that express Brms1 using polyoma middle T oncogene-induced models. Brms1 expression did not significantly alter growth of the primary tumors. When expressed ubiquitously using a β-actin promoter, Brms1 suppressed pulmonary metastasis and promoted apoptosis of tumor cells located in the lungs but not in the mammary glands. Surprisingly, selective expression of Brms1 in the mammary gland using the MMTV promoter did not significantly block metastasis nor did it promote apoptosis in the mammary glands or lung, despite MMTV-induced expression within the lungs. These results strongly suggest that cell type-specific over-expression of Brms1 is important for Brms1-mediated metastasis suppression. The online version of this article (doi: 10.1007/s10585-012-9452-x) contains supplementary material, which is available to authorized users. We would like to thank Dr. Clinton Grubbs in the UAB Department of Pharmacology and Toxicology for processing and preparing all histology slides. We are grateful for the counsel of Drs. Terri Wood and Rosa Serra during the course of these studies. We also thank Dr. Monica Richert for aiding in early colony maintenance of our transgenic mice and members of the Welch and Hurst labs for critical reading of the manuscript. We apologize to those whose work could not be cited due to space limitations. This paper is published in partial fulfillment of the requirements of the doctoral dissertation of LMC. Grant Support: National Institutes of Health [CA87728 (DRW), CA134981 (DRW) and CA089019 (DRW & DRH], National Foundation for Cancer Research (DRW), and Susan G. Komen for the Cure [SAC11037] (DRW); UAB Cancer Prevention and Control Training Grant [CA47888] (LMC); American Cancer Society [RSG-11-259-01-CSM] (DRH). DRW is an Eminent Scholar of the Kansas Biosciences Authority. The Transgenic Mouse Facility and Biostatistics Shared Resources were supported by the UAB Comprehensive Cancer Center core grant P30 CA13148. We certify there are no conflicts of interest.